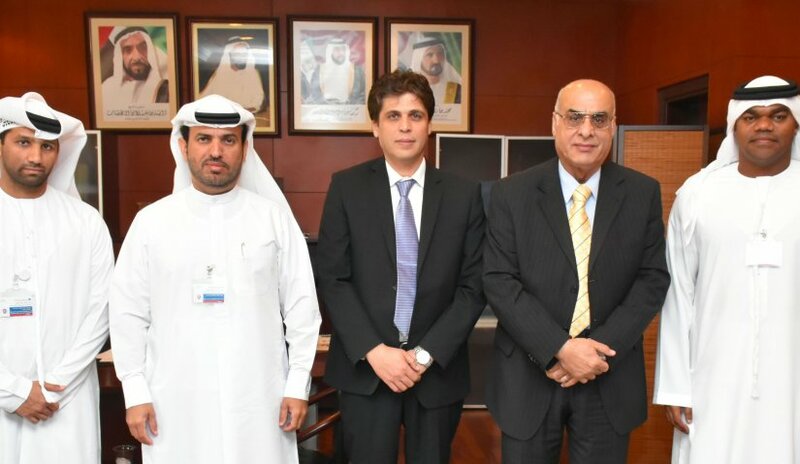 A delegation from Al Falah University headed by Dr. Sameer Barghouthi, Vice President for Academic Affairs visited the headquarters of the Department of Islamic Affairs and Charitable Activities in Dubai to discuss aspects of cooperation between the two parties and enhance partnership in charitable fields. Prof. Nasr Abbas, Dean of Student Affairs accompanied Dr. Barghouthi. Mr. Ahmed Al Muhairi, Executive Director of the Charitable Sector welcomed the delegation. The parties discussed the role and effort of the Department of Islamic Affairs and Charitable Activities in spreading the true Islamic knowledge as well as charitable works and initiatives launched by the Department to spread good among the community in the UAE. Dr. Barghouthi on the other hand, gave a detailed description of Al Falah University and the plans it seeks to implement in the near future. He also discussed the role of the University in charitable works; community services and interaction through many charity initiatives, as well as voluntary lectures by faculty members that help raise awareness in the UAE community to strengthen the culture of giving and charity work. At the end of the meeting, the two sides stressed the need to strengthen relations between them and to exchange ideas and knowledge about the charitable initiatives that the university seeks in the coming period especially during the holy month of Ramadan.